Creatively made to resemble a delicious cupcake, these Personalized Candy Cupcake Favors are a welcome addition to your special event. 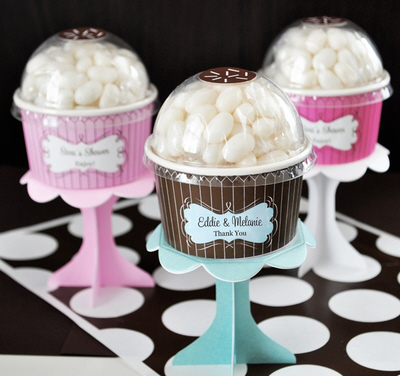 Add a unique touch to your cupcake themed soiree with these cupcake shaped favor boxes, gently "frosted" with tasty vanilla flavored jelly beans, and finally topped off with "sprinkles" in the form of a label on top. The base of each box is fashioned to imitate the lines on a cupcake wrapper, making your cupcake crazed guests eager to dig into this innovative packaged treat. These adorable jelly bean filled favors also come with personalized labels that allow you to add your own personalized message for your family and friends! Whether you're celebrating a birthday party, wedding, bridal shower, or baby shower, these delicious favors are the perfect accessory for your special day. Includes vanilla flavored jelly beans which are neatly prepackaged in the favor, ready for presentation. Size: 2.5" Base Diameter x 3 " High. Contains approximately 50 jelly beans.